Mung Flour – Gluten free, High protein, Vegan. Just 1/4 cup of mung bean flour packs a powerful 13 g of protein, 9g of fiber, 30 g of carbs, 180 calories, 3 g of sugar, and zero fat. Not only this, it is high in iron, folate, copper, magnesium, manganese, phosphorus and potassium. Although it is higher in calories and carbs than grain flours, mung beans are considered a low glycemic food (38) WOW ! Spinach – one cup of spinach contains 40 percent of your daily value of magnesium, a mineral that can help regulate blood sugar levels — important because people with type 2 diabetes frequently have low levels of magnesium … and .. and… just 7 calories ! Cabbage – Eating cabbage is an inexpensive way to add vitamins K and C and antioxidants to your diabetic diet. Cabbage is also a good source of manganese, fiber and vitamin B. Perfect ! So, lets get cooking ! Take a big bowl for this. Add in the spinach, fenugreek leaves, coriander leaves and cabbage and mix well. On on top of this, add in the mung flour, spices, garlic, ginger, 1 teaspoon oil and mix well. once well combined. Let it rest for 10-15 minutes. After adding the salt in the mixture, the green leafy vegetables will release some water and you can then control the consistency of the mixture. After the resting period is over, slowly start to add in some sour yogurt at a time and mix well to form a sticky, soft dough.The consistency depends on your preference. I like to keep it pretty loose but still enough to be able to form into shape. The more the moisture, the softer the muthiyas. Now, apply some drops of oil on your palms and take a handful of the mixture to form sausage type rolls. Applying oil on palm prevents the mixture from sticking to your hands and is easy to handle. Steam the rolls for about 15-20 minutes. You would notice that the size of the rolls will increase a little upon steaming. Remove the rolls from the steam pot and keep aside for 10 minutes or till they are slightly cooled down. Now, taking a serrated knife, cut the rolls into thick discs and keep aside. Take a skillet and add some drops of oil to it. Place some discs of Muthiyas and pan fry on high heat on both the sides (will take just a couple of minutes). 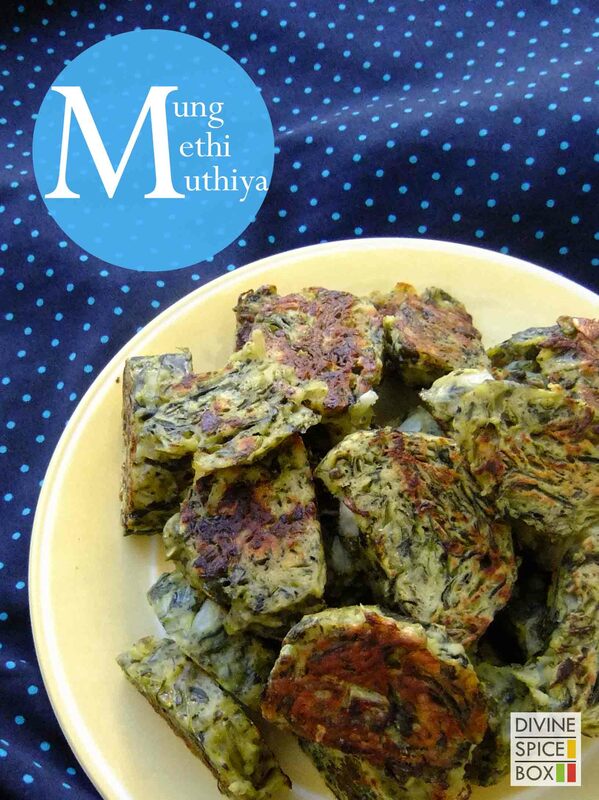 The Mung Methi Muthiyas are ready to be served and enjoyed. Serve this with a bowl of home made hummus or make yourself some tangy spicy Sichuan sauce for munching on these amazing dish. 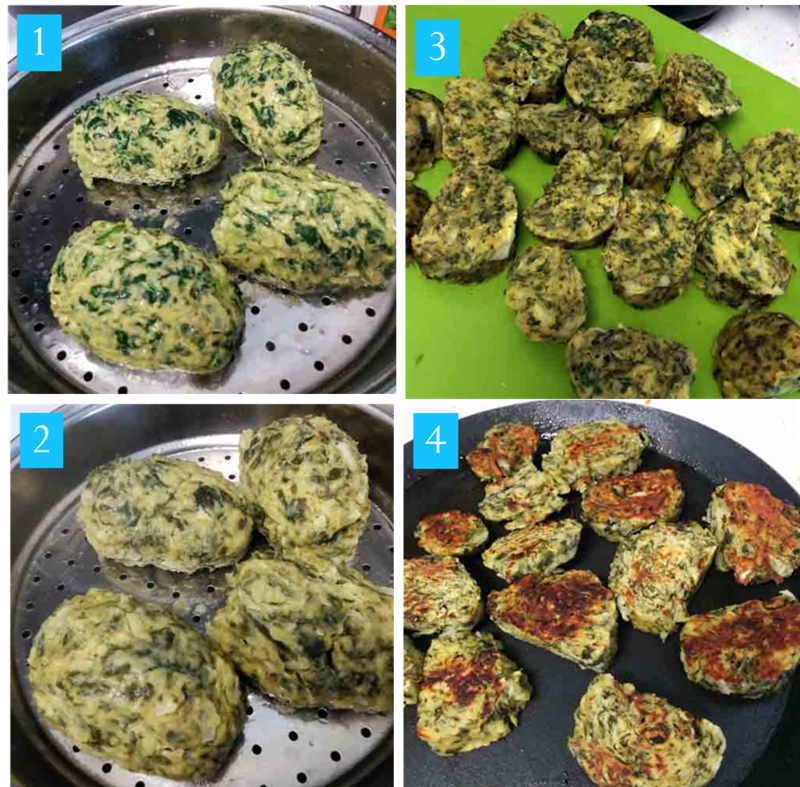 After pan frying, it forms a crunchy outer layer with moist inner and the fragrance of fenugreek lends a beautiful flavour to this dish with the low calorie bulk coming in from Spinach. Perfect ! Tagged appetizer, Diabetes friendly, Healthy, indian, Quick, Snack. This is just a fabulous share Prachi! I am going to try it soon myself. Brilliant. This moong version sounds delicious, Prachi. Love the addition of cabbage. Will save this recipe and try for sure!